He hires teens to rent their bodies to Enders—seniors who want to be young again. Callie, desperate for the money that will keep her, Tyler, and Michael alive, agrees to be a donor. But the neurochip they place in Callie's head malfunctions and she wakes up in the life of her renter, living in her mansion, driving her cars, and going out with a senator's grandson. It feels almost like a fairy tale, until Callie discovers that her renter intends to do more than party—and that Prime Destinations' plans are more evil than Callie could ever have imagined. . . 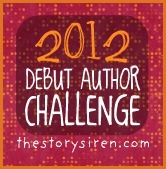 This is the eighth book in the 2012 Debut Author Challenge, hosted by the Story Siren. Yippee! Four more to go!! For a story that's supposed to take place in the future, it felt very bland and unimaginative. Most of the futuristic technology was similar to what we have today except for its name: text = zing, taser = zip taser, helicopter = heli, answering service = voiceZing, a large cookie = supertruffle, starters = young citizens, enders = old citizens. So why not just set the story in current time instead of trying to fake another world? Callie's parents are dead when "Spores" are sent to Los Angeles from an attacking nation. What the situation was, I'm not told except that it set the stage for those not vaccinated to die. Now I'm assuming these spores are some kind of biological warfare agent, maybe a virus or bacteria...But according to Price's FAQ's, these spores are NOT viruses. So. Then...uh... what are they? If they are not viruses, then what kind of vaccine were the scientists creating? Price compares this vaccine to a flu vaccine that's given to the young, old, and infirm. But here's the thing I don't get: if the government knew that our immunity system could not defeat these "spores" (like a typical flu) then why would it even matter who they gave it to? Anyone non-vaccinated dies from exposure to the spore; it doesn't matter who they are. So looking at it in a purely LOGICAL sense, wouldn't you want to keep the middle-aged and younger generation alive to populate humanity and contribute to society? Why keep the OLDER generation-even if "modern medicine" could help them live to be two-hundred? AND if "modern medicine" could keep the old alive and well-functioning, then why would they need to rent a "younger body?" Of course, Callie's parents didn't get the vaccine (since they are in the middle age group: 20-60). Also her dad did not want to use his "position" to acquire it. This made no sense to me at all: you're telling me that her dad would rather put his ethics before the welfare of his children? He KNOWS that if he and his wife are gone, Callie and her brother would be left on the streets (according to the rules of the government). Sorry, but I don't buy it: first, a parent would do anything to live and protect his/her children. second, you're telling me that the government did away with estate planning as well? She could've been such a great character. In the beginning, she's in a difficult situation and makes the choice to become a DONOR (a rented body for the Elders to use) to earn money to take care of her brother. But after she went to the Body Bank, I think her brain got switched because she acts so confusing. Through a malfunction to her brain chip she discovers that her renter wants to assassinate the Senator to prevent him from making a deal with Prime Destinations that will allow renters to permanently occupy donors. First, she doesn't want to be involved in killing anyone but then later on, she has a change of heart, and decides she can kill. What!!!??? And then there's the romance insta-love with the Senator's grandson Blake who she keeps thinking about. Which is somewhat understandable since she misses this fancy lifestyle but then later on she finds out he was actually a rented body occupied by the evil mastermind (Old Man) of Prime Destinations. And what do you think she thinks about that? His touch transported me back to the times we'd spent together in his car. I'd missed all this so much. Then when she gets caught and sent to a prison/institution, she tries to prevent a girl from going to Prime Destinations WITHOUT telling her it's because they will do awful things. Oh, and then that poor girl DIES so Callie can escape. Now why would any girl that you've only known for a few days DIE for you? What could have been an interesting premise (old people renting bodies from the young) was so poorly executed with weak details, unimaginative descriptions of sci/fi elements, and a senseless dystopic world. All this fluff didn't impact the plot of the story. It could have easily evolved the same way if Callie was orphaned by some other means, living on the streets without a war. It didn't add anything to the story. It was a confusing and left me irritated and frustrated. Buy Starters on Amazon here. Thank God I read this review! Ok, I had a weird online encounter with the author which put me off reading the book at all. I thought maybe I was being a little irrational, but I felt that her personality online would translate into a crappy book. I was totally going to buy it and give the benefit of the doubt. You just saved me money! @Perla-now you've got me curious! The bummer about this one is that it has such an interesting premise but totally poor execution. I was also a bit surprised to find that the author posted a "review page" with information/guidelines for blogger/reviewers...seems like I should be able to review a book without additional information. It's awful you didn't like it! It sounded so original - but if you don't like the characters, then no matter what the plot is like it makes no difference. @Christina K.-I know! It really really sounded so interesting and maybe I'm more critical when it comes to dystopian/sci-fi elements because so much of the story is based on that. @Sayomay-I'm sad it didn't work out either. Great review! The idea for this story is so original that I am sad to read in your review that you didn't like it. 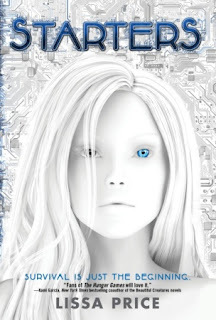 I like reading dystopian books but if this one left you confused, irritated and frustrated, that's not good! Thanks for the info. @Suz Reads: I think that's why it left me with such a bad taste; the idea was so unique and the story could have been so much better. Very sad indeed. Divergent: Which faction are you? Replication: Would you clone yourself? Slayers: Where has my author gone? How to Sharpen Pencils: Wait, are you for reals?